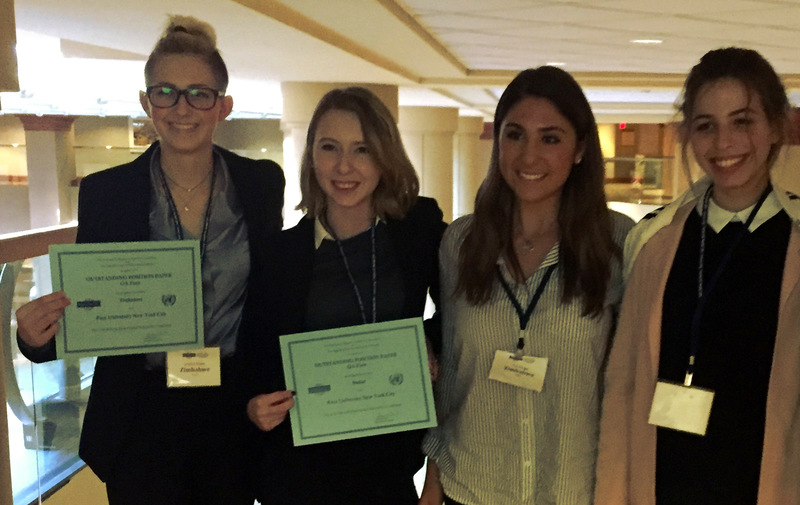 Pace University New York City Model UN students Jessica Halee ’19, Emily Rochefort ’19, Gia Tango ’17 and Giulia Di Stravola ’19 (left to right) at the 2016 National Model UN conference in Washington DC. Attending the 2016 National Model UN conference in Washington DC, I met the most hardworking students I have ever seen. They use expository writing to persuade other delegates about the issues under consideration. Along with my committee I learned how to come up with coherent resolutions to problems. This helped us understand each other and made me more aware of the problems going on around the world. I have a different view on how diplomacy actually works and its purpose. It has given me more self-confidence and exercised my leadership skills. It pushed me out of my comfort zone while caucusing with other delegates. I had to be well informed and organized as I conducted myself in the committee. Model UN has impacted my life for the better. It is a thrilling experience and something I would recommend to others. This entry was posted in Student Delegate Blogs and tagged diplomacy, Gia Tango, Model UN, Washington DC. Bookmark the permalink.